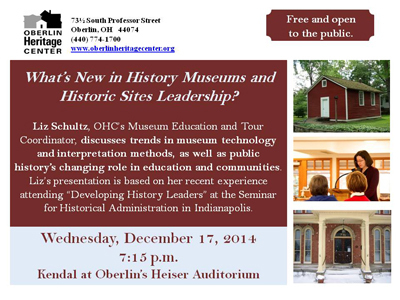 December 17 (Wednesday, 7:15 p.m.) OHC's Museum Education and Tour Coordinator Liz Schultz discusses What's New in History Museums and Historic Sites Leadership with a review of trends in museum technology and interpretation methods, as well as public history's changing role in education and communities. Liz's presentation is based on her recent experience attending "Developing History Leaders @ SHA" (Seminar for Historical Administration), the preeminent training course that takes place every autumn in Indianapolis, which is sponsored by the American Alliance of Museums, the National Park Service and others. Location: Kendal at Oberlin's Heiser Auditorium.